Probably a bit of both. Senior Journalist Peter Firth from the Future Laboratory – one of the world’s most renowned and respected trend forecasting consultancies speaks of the beginning of his career in the most understated fashion. Citing the article “Doormen in it for the kicks” in the Guardian as his first commissioned piece, having just graduated from London School of Journalism, his articles can be seen in Total Guitar Magazine, Songlines and the Hackney Gazette. But it wasn’t until he joined LS: N Global of the Future Laboratory, did he witness exponential personal and career growth. On some occasion his words are heard by an audience of 400-500 people including clients from Microsoft and Harrods in Tate Tanks. Firth in a telephone interview speaks to me about what the futures industry entails. Firth has given Trend Briefings to brands including Marks & Spencer, Estée Lauder, Microsoft and Harrods, examining consumer behavior through case studies, quantitative data and expert analysis. Trend forecasting as an industry seems to resonates with the ideas of many contemporary cultural theorists. Michel Foucault, Friedrich Nietzsche and Pierre Bourdieu to name a few have all made their prophecies on what the western societies could become and underpinned the principles that fuel the subsequent commercial affluence. In Firth’s work however, it is not as taste driven or theoretical like you’d except. Firth’s predictions are based on empirical data, the results of think tanks, and a congruence with the opinions of industry experts such as Stephan Sigrist from Wire and Steve Vranikis the creative director of Google. These foundations underpin the accuracy and confidence in the trend future forecasting. F: “The future is here, it’s just not evenly distributed.” Firth quoting William Gibson. Tactfully exploring social shifts and human behavioural patterns, LS: N Global clears the visions of the lucky and selected few who bare the privilege of seeing life from the other side of the microscope, by subscribing LS :N Global‘s reports – some of which are often adorned hilarious and intentionally self-referential and peudo-scientific titles such as the upcoming one in New York called “The Polarity Paradox”. Since April 2012, Peter has been technology publication T3’s futurology columnist, examining the big questions surrounding our long-term relationship with technology. 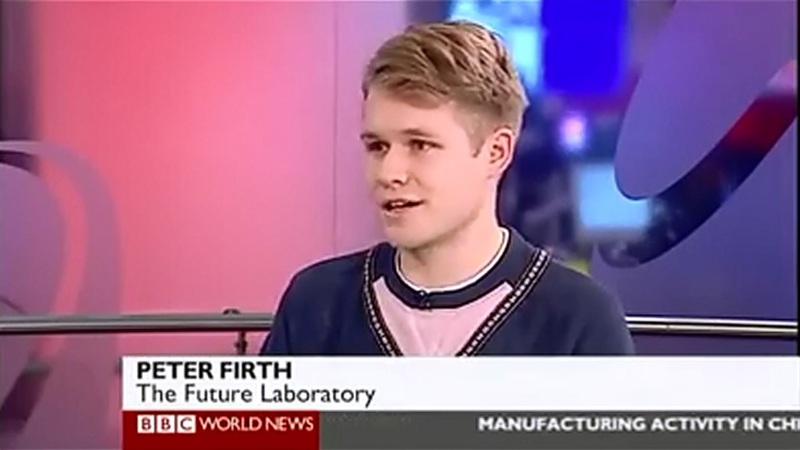 Firth on BBC World Service, “The Hub”, December 2012 Discussing the future of human communication, as well as the first wifi linked communication between two people’s pulses. Trend forecasting has definitely taken journalism into new grounds as the newly “taken off” form of journalism aims to drive commercialism within a codependent club as oppose to the old fashioned extra extra that’s just in. We are definitely witnessing a divisive industry which trades information about who wears what, what sells where, where likes whom secretively and hyped-up more than stock prices. N: It seems to me that your work is closely tied in with commercialism and your findings are targeted at the middle class, which casts out a big sector of the bigger society. Do you ever feel that your work may carry some social responsibilities? Do you ever feel a bit detached from traditional journalistic work? F: There are a lot of independent factors that weigh in here. First of all you become a journalist, you kind of want to believe in free speech and the idea that the public has the right to know about what goes on internationally, their locale and all the rest of that, which is what I completely agree with. It is kind of interesting to be on the business side. Essentially it’s not doing the same thing. It’s the same set of skills, you are doing it to empower organizations, which is kind of strange, but those organizations are not always the big and frighting ones, quite often some of them are small design studios and starting up ad agencies, people that are doing interesting work, the work itself might have an element of social responsibilities to it. That’s definitely an angle. Also that form of journalism is taking off. You are using the skills of a journalist to pursue other angles. The angle I should take with my skills learned in school as a journalist may not be as arbitrary as I might believe. The girl who makes my coffee in Shoreditch Grind calls herself a writer/blogger/journalist. I’d imagine becoming a barista was probably not the best angle for her. LS:N Global senior journalist Peter Firth explored the topic of Millennial luxury consumers with 22-year-old Amber Atherton, founder of online jewellery and accessories boutique MyFlashTrash. It took me 3 weeks and at least 10 emails to get Mr Firth on the phone. Judging by the sound quality, he was talking to me on a mobile phone while walking in the cold streets of London. As a journalism student who has yet to get an article commissioned, and I know I am not alone on this, I had to ask what it takes to break into the industry. N: There’s this tweet of yours, “There’s often a no before a yes.” I certainly had a bitter sweet taste of what that quote entails. Can you tell us about your experience in some of the hardships or disappointments on the road to success? F: I know what you mean. I think it’s really tough to try and break into journalism. It’s kinda infamous. You know what, it’s probably even tougher now than it was when I was trying in 2009 or 2010. I think it’s just about perseverance. I think you should just TRY (X5), that’s how I sort of did it. I started as an intern at LS: N Global and it was kind of position swoop and I guess it was enthusiasm which did it rather than any degree of talent. At the beginning for a certain time, I didn’t particularly believe in my talent, or actually I think I did, but it was that [enthusiasm] which was attractive. Remember I said “you are here because of your enthusiasm”. The next LS: N Global Trend Briefing – The Polarity Paradox takes place in New York on March 19. What does this mean for brands, stores and products? What does this mean for Peter Firth? And what does this mean for student journalists? I’d certainly want to be him, especially on that day. omg i just called Peter david (maybe you could edit that mistake for me). I’m rubbish with names – but it’s no excuse. And apologies to Peter. Sorry! Thank you so much nicola, I haven’t sent “david” well Peter the link yet.